Nature doesn’t refine sugar. But refined sugar goes into your sparkling wine. Earlier this month, a group of leading Italian wine writers sat down to taste a flight of nine wines, spanning 10 years, with my friends Nico Danesi, Andrea Rudelli, and Giovanni Arcari. 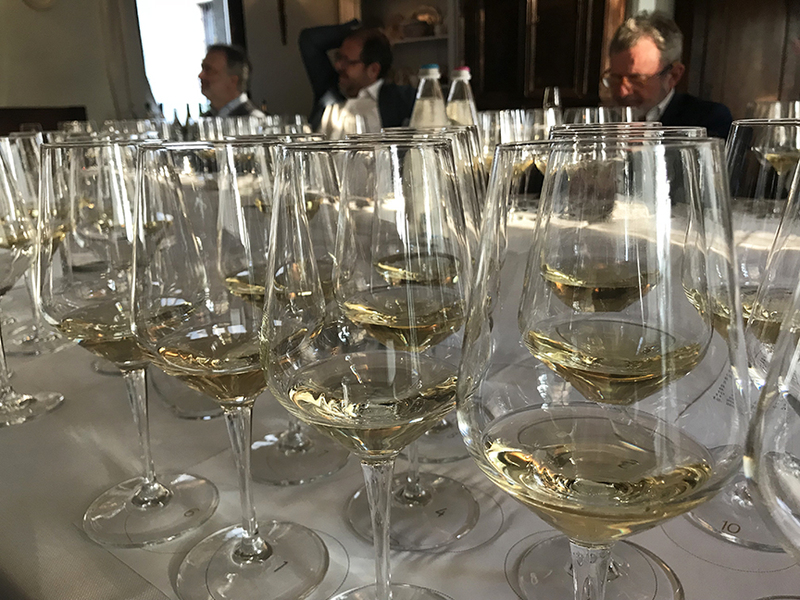 Beyond their own wines (Arcari e Danesi, SoloUva, and Vezzoli Giuseppe, a 2008-2018 retrospective), the three Franciacorta growers and producers also included current-release wines from three marquee Franciacorta estates, covered in foil, to be tasted blind that evening. 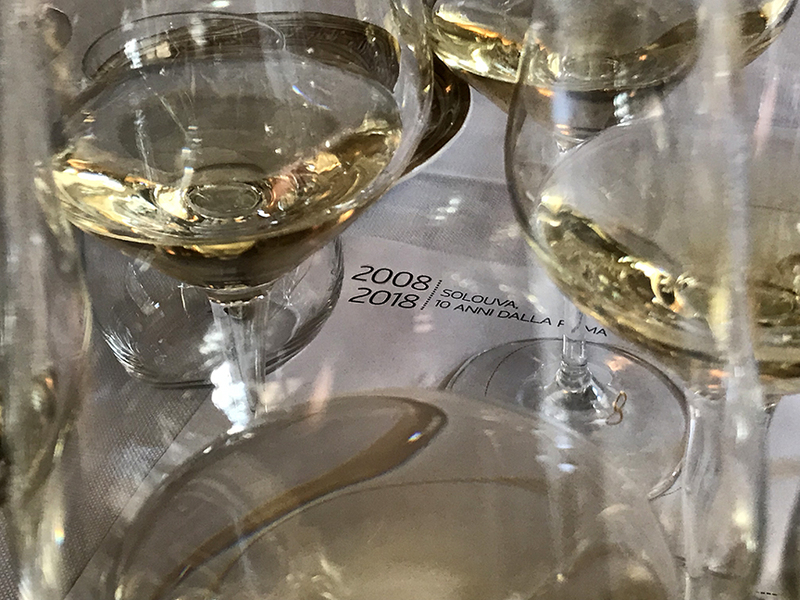 The idea behind the tasting and selection of wines was to highlight the differences between wines made using the classic method and wines made using what the three 40-something franciacortini call the SoloUva (SOH-loh-OO-vah) method or Just Grapes method. The classic method is analogous to the Champagne method (the fundamental difference is that only wines grown and vinified in Champagne can be rightly called “Champagne method” or méthode champenoise wines). A “base” wine or wines are produced as still wine or wines (non-sparkling). A sweetener and yeast are added to the wine (or blended wines) to provoke a second fermentation (the tirage). The wine is sealed in bottle. The CO2 resulting from the pressurized second fermentation gives the wine its fizziness. The wine is then allowed to age “on its lees” (i.e., the dead yeast, a solid that results from fermentation). At the appropriate time, the wine is “disgorged” of its solids. It’s topped off with a sweetener if desired (the so-called liqueur d’expédition or dosage). And the wine is resealed and labeled for release. The difference between the classic method and the SoloUva method (developed by my friends) is that the classic method calls for refined sugar to be added for the tirage and dosage (topping off) while the SoloUva method calls for reserved grape must to be used as the agent for the second fermentation and the topping off of the wines. Among the wines that Nico, Andrea, and Giovanni selected from their own cellar for the tasting, there was a dichotomy: two of their wines had been produced using the classic method; the three “blind” wines from other producers were also made using the classic method; and the remaining seven wines were made using the SoloUva method. As they tasted through the 12 wines before them, the Italian writers immediately noted the blaring difference between the two categories: the classic method wines had distinctive aromas of “brioche,” “yeast” (a canonical descriptor, however misleading), “toast” etc. ; the SoloUva method wines had “fresh” fruit aromas. The discussion that followed (on picking times, phenolic ripeness, and different approaches to sparkling wine production) was as interesting as it was provocative. But it was plainly clear to all present that the oxidative style of classic method wines was starkly contrasted by the fresh and ripe fruit style of the SoloUva method wines. Nico, Andrea, and Giovanni are not the first to employ reserved grape must as a sweetener in sparkling wine production. But they may be the first to propose such a method as a “purer” expression of their appellation. Why add exogenous (as opposed to autogenous) cane sugar from Brazil when you can use grape sugar from the very same appellation? they asked their interlocutors. When they call into question the wisdom of centuries of classic method wines from France, they may be veering from the enological into the ontological. But over the course of the gathering, Nico changed the nature of the conversation when he pointed out that refined sugar doesn’t occur in nature. Only humankind produces refined sugar, he noted, and refined sugar is partly to blame for many of contemporary society’s health challenges. Nearly all sparkling wine is produced with the addition of refined sugar (and not just classic method wines; Charmat, Martinotti, and even some ancestral method wines are made using refined sugar). Wines labeled dosage zero, brut nature, and pas dosé are also made with the addition of refined sugar (some may be surprised to learn this). Only history will reveal whether or not Nico, Andrea, and Giovanni’s wines will represent a new era of sparkling wine production. I like their wines a lot. But take my opinion with a grain of salt spoonful of sugar because I am biased by our friendship. What I can tell you for certain is that their wines don’t contain anything that nature didn’t give them. Here’s a song I wrote for them a few years ago (MP3). This entry was posted in de musica, de rebus familiaribus, de vino. Bookmark the permalink. Michael, thanks for the comment and for checking out the post. Misinformation and misunderstanding about sparkling wine continue to plague our industry. It’s mind-boggling how wine professionals with excellent chops often have no understanding of how these wines are made — and even more importantly — how to taste them. I’ve been doing a lot of reading on ancestral method wines lately. There’s actually a wide spectrum of wines. Even Moscato d’Asti falls under that category, believe it or not. Col fondo producers, for example, add some sugar to the wines at bottling. See you in a couple of months. Dear Jeremy, I just discovered your blog, really interesting! Also this post, I wasn’t familiar with the SoloUva method. Just one question : what do you mean with oxidative style of the classic method? The sur lie aging protects against oxidation. Or are you referring to something else? Lees aging does protect against oxidation, yes. But the “yeasty” and “pastry” notes you get in a classic method wine (like Bollinger, for example, one of my personal favorites) are the result of the sugar oxidizing after disgorgement. It’s one of the biggest misunderstandings about sparkling wine. 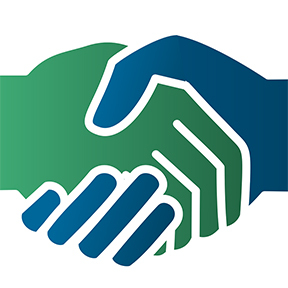 Thanks so much for checking out the blog and the comment. Pingback: "Nature doesn’t refine sugar. But refined sugar goes into your sparkling wine."